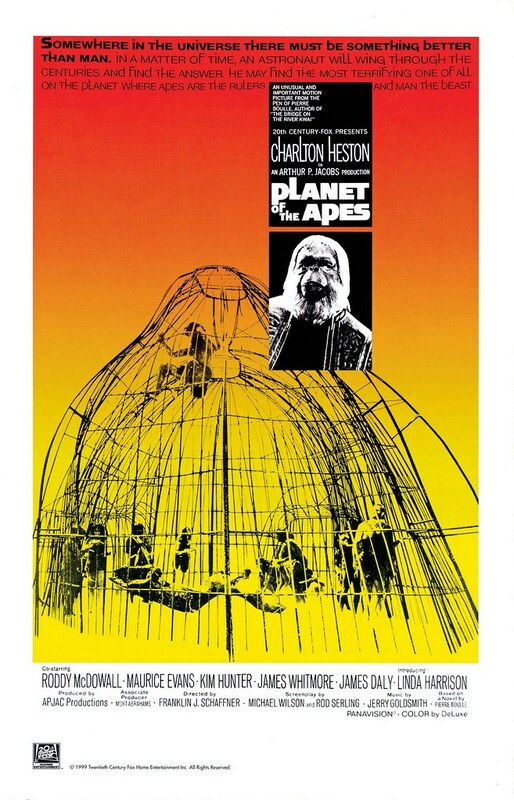 Hola, the Dude here, with some far out scans of the original Planet of the Apes movie posters. I discovered this cool site called IMP Awards with tons of movie posters. I've stolen some to share with you here. Please keep it between us, I have enough legal problems as it is. 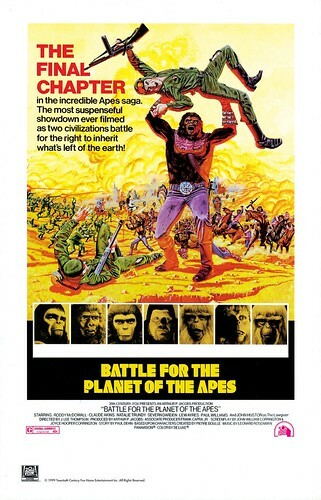 I was way late to the Apes party, caught the first 3 films after they premiered on CBS in the 70s. I remember seeing the first Apes film advertised all of the place in Los Angeles when it came out. I am sure there were many variations on the poster released all over the freakin' world. Did the original Apes poster really did show the full on makeup? I think this version shows you just enough to wonder, with Dr. Zaius in the spotlight. Looking at this poster with a fresh pair of eyes, the frightening part of this is the cage for the humans; where exactly did they go to the bathroom? You can tell from this poster that the third movie, Escape from the Planet of the Apes, has loads of comedy. Cornelius, Zira, and the baby who will become Caesar are framed in an old American western style photograph. 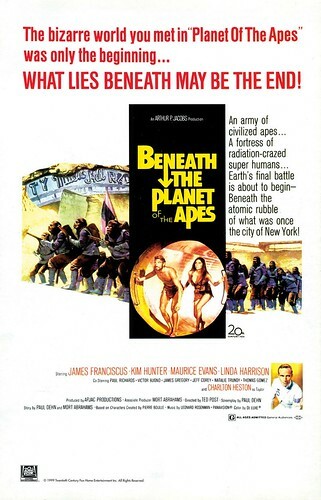 Below the logo, the Apes look bewildered in those spacesuits as they enter the strange world of humankind. I heard someone once say that fiction should never try to combine comedy with tragedy. A story had to be one tone all the way from beginning to end. Whoever said that didn't watch a lot of 70s films. 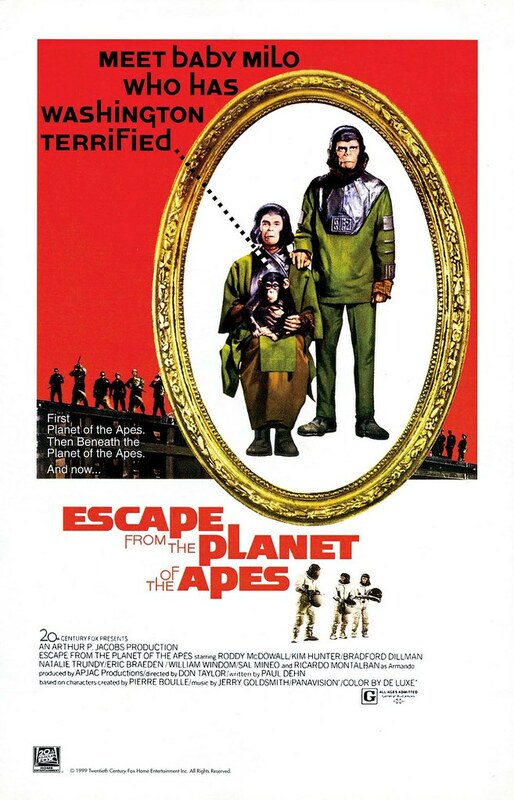 Escape is a perfect example: lots of laughs through the second act as Cornelius' family become celebrities and go on TV talk shows, but after the government figures out that Apes ruled the future Earth, there is one hell of a downer ending. My advice to you: do not take Quaaludes while watching this flick! Conquest of the Planet of the Apes is one of my favorite films and the revolutionary story makes for a great poster. The logo explodes three dimensionally at an angle, just enough to blow your mind, even if you aren't stoned. The apes revolting and the police gettin' ready to force them away sends me back to Berkeley. Even though I was never accepted to Berkeley and didn't go to college in the 70s! It's that powerful! Did you know Fox is getting ready to re-make Conquest? It's going to be called Rise of the Apes. I am highly skeptical, IMHO you cannot possibly improve on this classic. Ricardo Montalban and Roddy McDowell are irreplacable. The ending of this film is a bit of a downer as well, with Caesar's speech providing the vision that the entire world (beyond Century City) is going to be overrun by Apes! 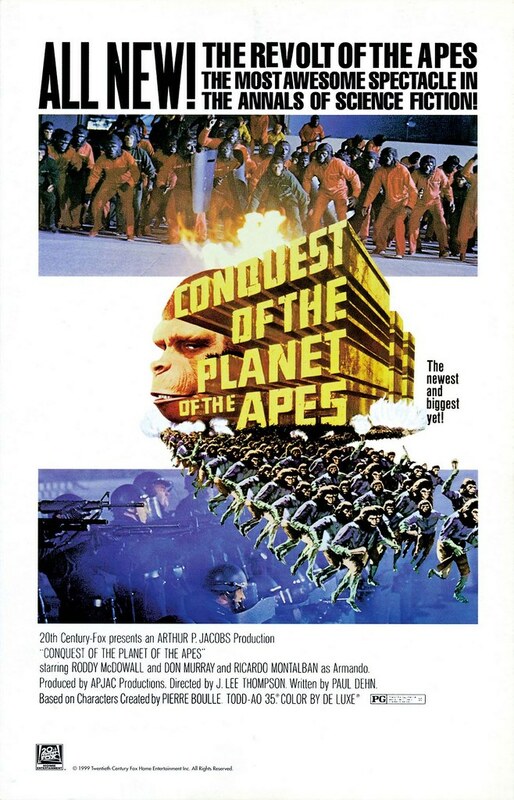 Will the remake show us scenes of Paris, Moscow, Beijing all conquered by Apes? Now that stirs the imagination. What would Apes look like speaking in French or Mandarin? A Russian Ape, that would be quite funny. Beneath and Battle are two of the worst posters. Beneath should have featured Linda Harrison as Nova front and center. I would have also made a Nova spinoff, a Nova TV show, and Nova door-size posters. BTW, there is a neat little interview with Linda Harrison over at the Forbidden Zone. I think Battle was the least profitable Apes movie because of this godawful painting. Why highlight General Aldo (who doesn't look all the frightening) instead of Caesar, the Ape who just conquered an entire friggin' planet? Big mistake, Arthur P. Jacobs! Your bank account was in for a world of hurt!